Waldo is a photo-finding phenom. With Waldo, every photo of you and your family, taken by Waldo-fied photographers, is delivered to your smartphone. Whether you’re at your daughter’s tennis match, missing your kids at summer camp, on family vacation at a beach resort, or at your cousin’s wedding, Waldo finds all your family’s photos and delivers them to you. Drop the selfie stick, put your phone in your pocket and Live the Moment! The days of wishing you could have gotten that incredible photo from an amazing photographer are now a reality. Welcome to the future. Welcome to Waldo. Waldo brings AI and a mobile photo delivery platform to summer camps, pro & amateur photographers, schools, youth sports, resorts and weddings and events. 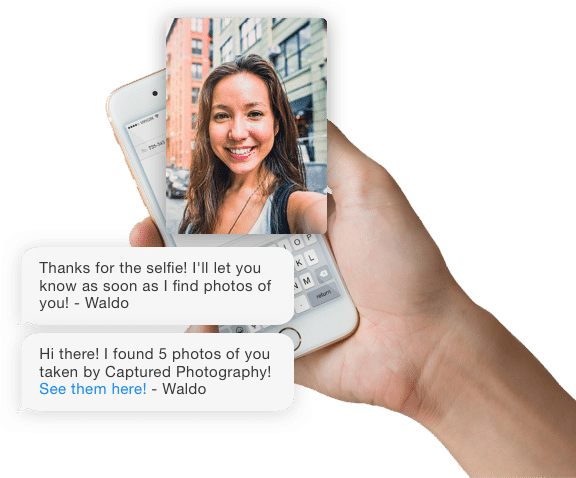 Using proprietary technologies that combine facial & object recognition, GPS, and real-time cloud delivery with the convenience of a text-based interface, Waldo enables photos to flow from the photographer to the photographed, as seamlessly as they should.
" I love Waldo because it's so simple. Not having to scroll through hundreds of photos to find the few you’re interested in is a total game changer! " Folks are talking about us! Help us revolutionize mobile photo delivery and work on exciting projects with talented people.